If you think starting a business requires great connections, lots of startup capital, and massive overhead, then you’ve been overthinking. In the age of overnight internet entrepreneur millionaires, it’s easy to overlook other opportunities available to start a profitable small business. Pay close attention as several of these may have crossed your mind at one point. Offline/Online Used Book Sale Business Selling used books is not for book stores only. You can launch your own used bookselling venture on a local level. Start by getting exposure at neighborhood garage sales and flea markets. Garage sales are personal to their particular owners but you can get in by negotiating with a financial incentive. This requires offering a percentage of each book sold to the property owner. It’s a great way to get the initial word out about your business, similar to doing house to house landscaping or car washing. It can also yield extra benefits for the home owner if you invite more people to come to their garage sale. Any garage sale owner would appreciate that. Do your research to find where garage sales are happening to get it going. An easier way to sell used books locally is through flea markets. Local flea markets are inexpensive for vendors. You generally pay a small fee ranging from $10 to $30 to setup shop. Once you get the hang of selling books locally you can expand online by selling through an ecommerce enabled website. This is also very inexpensive to setup, but requires a domain name, hosting fee, and an internet enabled computer. You also would need to setup a way to collect payments online. Paypal is the payment method most online vendors use, but there are others just as reliable. Most people don’t realize there’s a surplus of books discarded by their local libraries every day. These are books donated by individuals or businesses to the library. The library however regularly discard many of these donated books because they don’t adhere to the policies of books and electronic software or media accepted by a public library. Ask the librarian for these discarded books and they will direct you to them, sometimes reluctantly but you’ll get them nonetheless. To ensure you keep getting inventory from the library, it’s a good idea offer them a small amount of profit from the books sold, you don’t bite the hand that feeds you. You can also create a campaign to tell friends, relatives, and close business professionals to donate all books they do not need. You want to have a steady supply of used books from multiple sources in case one becomes unreliable. 2. A Sub-Niche Video Blogger (A Niche Within a Niche) It’s no secret that many people have spun Youtube and other large video sharing sites into a profit generating machine. A report in 2010 stated the top ranked individuals on Youtube channels were raking in a whopping six figure salary while 9 to 5 degree bearing counterparts were barely making the monthly mortgage. If you have a personality worth watching and a voice worth listening to you’ve got an easy in. The basic requirements are an account in good standing, a reliable computer with webcam or external video equipment, and sufficient time set aside to launch a homemade video production show. There’s a niche for just about every allowable subject matter on Youtube and they’re eager to watch and subscribe to whoever can deliver the visual content to them. You earn your revenue through an affiliate based partnership with the site. The more viewers and subscribers you have, the more profit you earn. 3. Ebook Affiliate Marketer Affiliate marketing has become big business thanks to major sites like Ebay, Amazon, Google, and Clickbank. The old days of shady multi-level marketing(pyramid schemes), and selling brand name knock off products to friends and neighbors have diminished greatly to make way for more legitimate and profitable services like internet retail resellers and digital media producers. 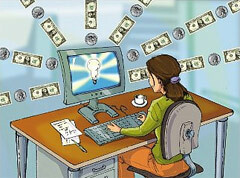 One of those digital media earning many stay at home entrepreneurs money are ebooks. Ebooks are basically the digital electronic version of hardcover and paperback books sold online. The ease of creation and publication of ebooks from a desktop computer to an ecommerce website, makes it an attractive option as a startup online business. You can create ebooks in several digital formats but the most widely distributed types come as PDF documents. Very large sites that offer ebook affiliate programs offer a more secure method of creation and sale delivery by offering an book as a downloadable EPUB file, the industry standard.